Can you give us a basic intro? Name, age, where you’re from, etc.? Tori Allen, age 24,…but, the “where I am from” part is more tricky…I was born in Auburn, Alabama and currently live in Steamboat Springs, Colorado. During my 24 years I have lived in 5 states and 2 foreign countries (3 continents in all)….so “home” is a relative term. The place I loved living the most was Savalou, Benin (West Africa), though. 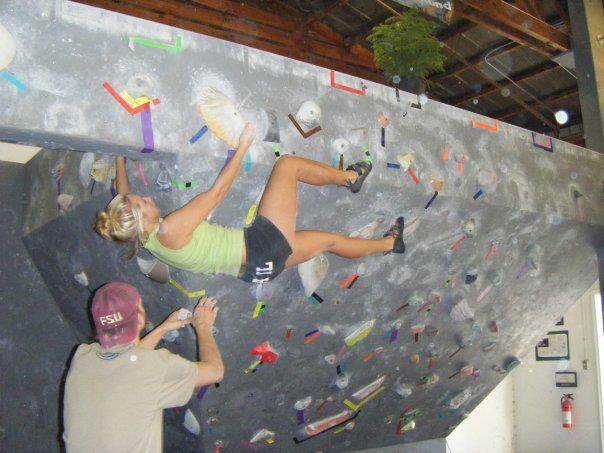 How old were you when you started climbing? What made you start? When I was 10 ½, I was Christmas shopping in a mall where a new sports store had just opened. When we went in the sports store and I saw their HUGE climbing wall, I had to climb it. It was easy for me. Over the next weeks, I kept asking my parents to take me back to the store so I could try harder things on the wall. Around New Years, my family joined a local climbing gym and I started climbing 4-5 times a week. I had never been so happy doing anything as I was when I found climbing. How did your life change once you started climbing? Six months after I climbed that wall in the sports store, I was crowned Jr. National Champion. From there, it was a blur. Within a year, I was entering and winning national level adult competitions. I was invited to elite competitions like the Gorge Games and the Mountain Games in Vail…and was winning those as well. Before I turned 12, I turned pro. I had sponsors for shoes, rope, gear, chalk, clothing (First, The North Face, and then Nike), sunglasses (Oakley), and even energy drinks (Red Bull). In fact, not only did I get free stuff from these companies, they PAID me to climb. Having sponsors meant having to travel to go to photo shoots and appearances, in addition to competitions, so I was on the road about 50% of the time. Then, I won the X-games right after my 14th birthday, and things got really crazy with TV appearances (from games shows to talk shows to Discovery Channel to Ripley’s Believe it or Not…and more! ), invitations to speak to various groups (I spoke to over 300 groups in 4 years), and lots of photo shoots for articles in magazines like Sports Illustrated. I had an agent. 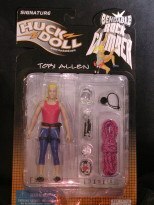 I had an action figure. I wrote a book. And, I had lots of haters. In the climbing world, all the attention I was getting, at such a young age, was rubbing people the wrong way. Plus, when I climbed, I was still a girly-girl. I designed and made my own climbing outfits so I would wear pink leopard print shorts, or shiny silver polka dot ones, or even tiger striped sports bras. It really stood out in the sea of neutral colored, baggy clothes most girls climbed in and made people even more annoyed at how I “didn’t fit in”. All the while this was going on, I was also a full time high school student (I started high school at age 13 after being homeschooled until 8th grade) and a competitive pole vaulter. Sometimes, I would literally have a national level pole vault meet in Nebraska one weekend and an elite climbing competition in Oregon the next. I would be home for one day in between to unpack and re-pack. My training during those years was also insane. I would go to vault practice after school for 2 hours and then drive straight to the gym for 3-4 hours of climbing. I spent my lunch hours in my coaches’ classroom going over vault video and I spent my “free” time writing speeches for climbing appearances and doing interviews for articles. And, when I traveled, I would work out in the stairwell of the hotel, running stairs and doing plyometrics for hours at a time. I loved every minute of it and wouldn’t change a thing. But, I really never experienced a “normal” teen life. Did you do any other sports growing up? How did you go from rock climbing to pole vaulting? I grew up in an African village. I didn’t do any sports there except play outside all the time. When I moved back to the USA at age 9, I took up figure skating, ballet and soccer.Yet, when I started climbing18 months later, I quit all three of those. As for pole vaulting, I saw Stacy Dragila vaulting on TV and announced to my mom that I wanted to do that because I loved heights. Then, a few months later, we were at the Indiana state fair and there was a pole vault competition going on. Seeing it in person was even more exciting and I decided that I wanted to learn how to flip over a bar like that. When I was 12, I started working with a local boys’ HS vault coach. I was still climbing competitively at the time. I continued to pursue pole vault and competitive climbing at very intense, high levels, year-round for the next 5 years. When I went to Florida State, though, I had to give up competitive climbing so I could be classified as an “amateur” athlete by the NCAA in order to accept my scholarship. 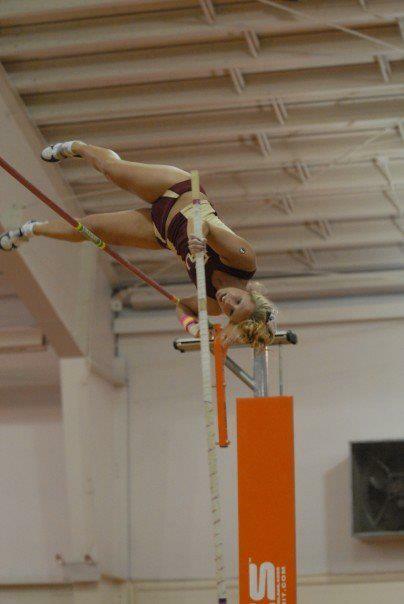 What made you decide to pole vault at Florida State? My “official” visits were at University of Florida, Florida State and Purdue (my parents made me visit one, in-state college). Although I had some offers from schools I did not visit, I had my heart set on moving to Florida (for the beach) and was looking for a strong overall track program. When I visited Florida State, I felt totally “at home”. After that visit, there was no question in my mind where I wanted to vault. You were always really into leadership and volunteer activities in college. What are some of the best experiences you’ve had in that area? Those activities really shaped who I am as an adult. Learning to budget my time between a job, pole vault, classes, social life, leadership and volunteering while in college gave me the skills to do that now, in my community. One of the greatest things that came out of my time in leadership at FSU was being selected to attend the NCAA national leadership conference at Disney. During that week, I learned things about myself and about my leadership style that have inspired me to reach for bigger and bigger leadership roles every year of my life since then. As far as volunteering at FSU, I really loved, and still do, going into local schools and speaking to students about reaching for their dreams. What are you doing currently? Are you still involved in athletics? Still vaulting or climbing? I live and work in the best mountain town in the world, Steamboat Springs, Colorado. Here, I have a pretty “normal” life for the first time in my life….work, play, hang out with friends. I have not vaulted since leaving FSU but may start volunteering to coach some girls at local high schools. On the other hand, since leaving FSU, I have been climbing a lot more. I don’t compete, but I am thoroughly enjoying the sport of climbing both outside on real rocks, and inside the gym. It’s a regular part of my life, and that makes me happy because, during my four years at FSU, it was not. The only competitive sport I participate in is rugby. I am on the Steamboat Women’s Rugby team, and I play wing (because I run fast). If I had found this sport a few years earlier, I may have tried to be competitive enough to play at a national level. But, for now, I am happy with my hometown team, playing against other women’s teams from all over the West. Work day=wake up at 7, shower, eat breakfast, leave for work at 7:40, arrive at work at 7:45, 1 PM take a break from work for lunch and a workout (a swim or a run or time on the elliptical), back to work until 5 PM, 5:30 go to a class at the hot springs gym…Jazzercise and Zumba have been favorites lately, home by 7 to make dinner, then either spend the night watching TV or playing board games OR, a few nights a week I climb at a little private gym built in a friend’s warehouse. In the summer I also play softball and practice with my rugby team a few nights per week. I’m usually in bed by 10 or so. Weekends=get up and make a HUGE breakfast (eggs benedicts, usually), clean the house, then get outside…wakeboard/bike/snowshoe/snowboard/hike/climb/play in a rugby tournament, catch a late lunch with friends, hit the hot springs to relax after a day of being active, come home to make a big dinner (usually steak and potatoes and a big salad), then watch movies all night. What is your go-to food when you go climbing? Trail mix, tuna on crackers, and, if we are camping on a climbing trip, I have gotten really good at dehydrating food to rehydrate over a campfire for a healthy, hearty, hot meal. Is there any other athletic activity that you like to do “just for fun”? A “healthy and fit lifestyle” is just that, a lifestyle. Describe what that means to you. When I was younger my choices were made in a “training” mindset…what impact would X have on my training? I scheduled my day around my training and chose my meals based on my training needs. Since I was in that mindset since age 11, when I became a professional climber, until age 21, when I graduated from college, it was hard to think any other way. Over the past three years, I have transitioned out of that mindset into a more balanced mindset. Now, I am more flexible in how I schedule my life. For example, I look at being active as more of a social endeavor, than a competitive one. By doing that, I have found the fun in participating in a wide variety of activities, rather than just one, over and over. I like the added benefit of staying in shape, but I am not “in training” for anything. Also, other choices like what I eat, how much I sleep… are based on their impact on my overall well-being rather than their impact on my readiness for competition. It’s a more relaxed way to live and I find that I am very happy with my “healthy and fit lifestyle”. What is one piece of advice that you would give anyone interested in living a healthy lifestyle? Commit to little things (new activities, new routines, new eating habits), one at a time, and stick to them, in order to build solid healthy habits that will add up to an overall healthy lifestyle. What is one quote that really motivates you? Any other tips or pieces of information that you’d like to pass on? Cooking with my boyfriend is one of the things that contributes to my healthy lifestyle. We are both good cooks and so we really plan our meals and like to try new things. We love eating our home cooked meals, so restaurant food doesn’t hold much charm. This has led to healthier eating choices for us…and lots of good memories.